A bar-headed goose on the wing. 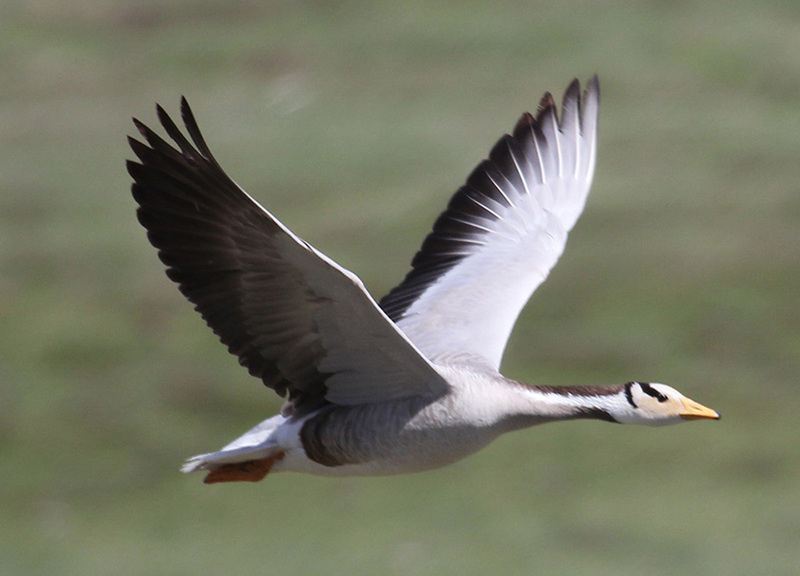 When bar-headed geese migrate across the spine of the Himalayas, they follow the terrain, roller-coaster style, rather than fly a straight-line path from ridge to ridge. 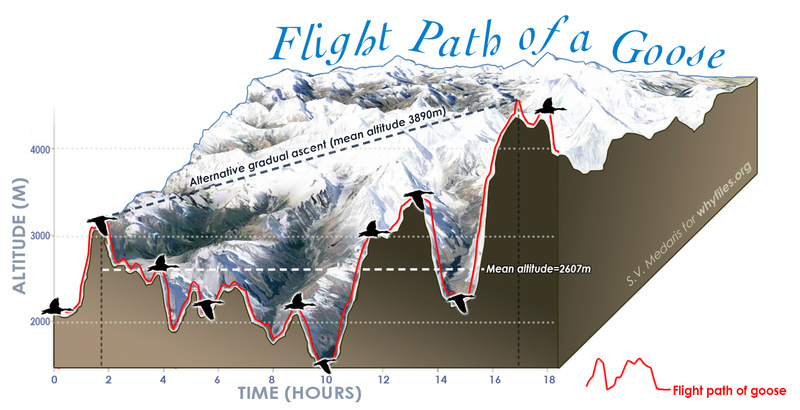 This flight path features far more climbing, yet a study published today in Science shows that it’s considerably more efficient than the straight-line course. Map and relief cross-section of South Asia shows the migratory flight of bar-headed geese. 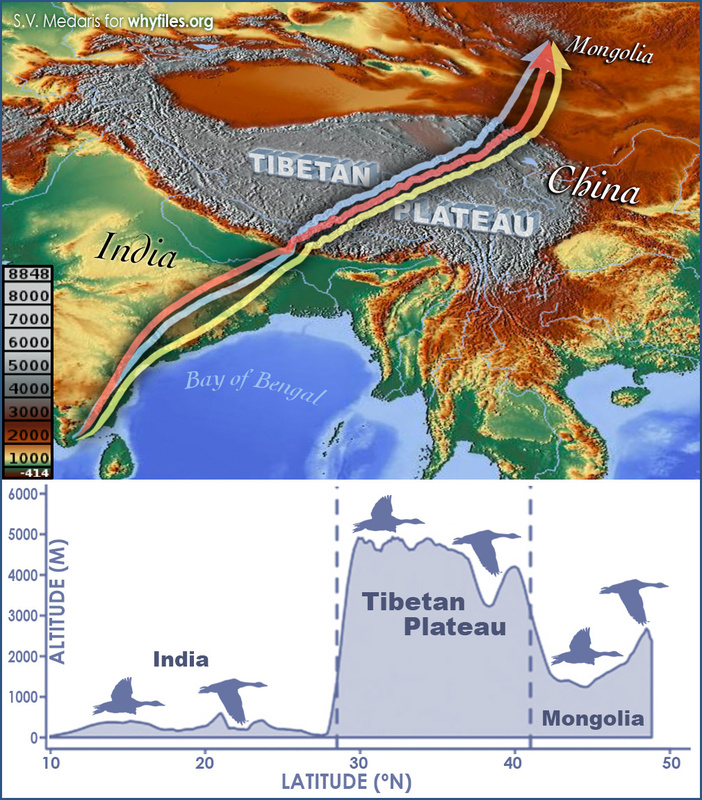 The high-flyer soars south from the Mongolian steppe, over the peaks of the Tibetan plateau, to the lowlands of southern India, and returns north. Map by The Why Files, adapted from L. A. Hawkes et al., 2012. 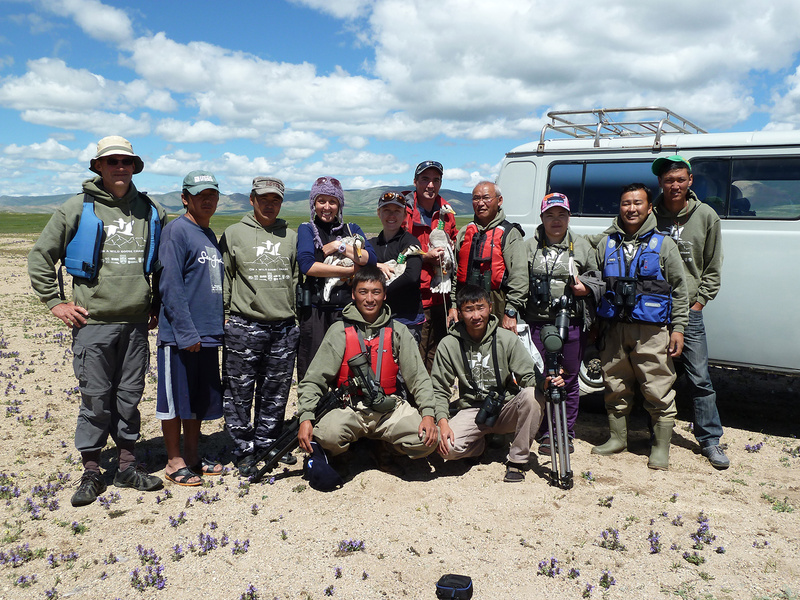 The field research team, photographed in Mongolia. In previous lab work with bar-headed geese, Bishop found that oxygen consumption changed according to the square of the change in heart rate. For this study, he extended the relationship backward to wing beat: On average, a 5 percent rise in wing beat increased heart rate by 19 percent and oxygen consumption by 41 percent. Thus a small change in wing beat has major consequences for metabolism and power output. The studies of energetics explained the goose’s surprising preference for the roller-coaster strategy. Even though they did more climbing, they exerted less energy than they would have needed on a course with far less climbing. The answer, Bishop says, lies in the drop in air pressure and density with altitude, which makes each wing stroke less efficient. By staying as low as possible, the geese save energy and also breathe denser air that contains more oxygen. To take the high road, or the low? 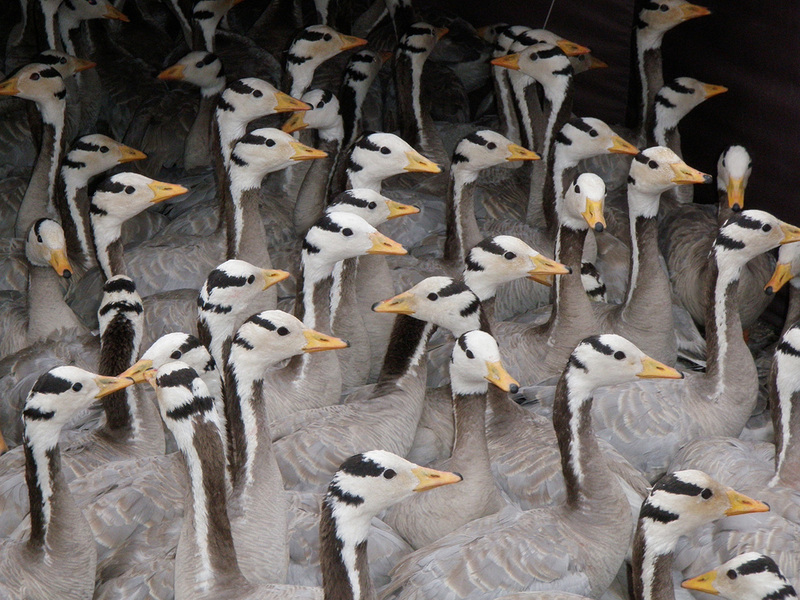 Bar-headed geese opt for a ground-hugging flight across mountainous terrain, despite the additional climbing of their roller-coaster route. Diagram by the Why Files, adapted from Charles M. Bishop et al1. Here’s a surprise: Although there were times when the geese seemed to “coast” (flap with less force, particularly during tailwinds and updrafts), there was no evidence of gliding — flying without flapping. “There were some dramatic cases where there was a massive climb rate with either no increase in heart rate, or a decrease, while they were climbing three times faster than the normal rate,” Bishop says.